I was asked if I would not mind tatting around a button as someone had a mark, or it could have been a hole on her fairly new t.shirt and she wanted to hide it. So I made three as I wasn't sure how big the hole was and of course there are many shades of white. No pattern just randomly tatted around a few buttons and as no beads were required they were done in no time. Last weekend I was given a large container of buttons, sadly they had been abandoned in a shed for many years and needed a good wash and brush up! I had to throw quite a few away as they were beyond rescuing, these were the best. 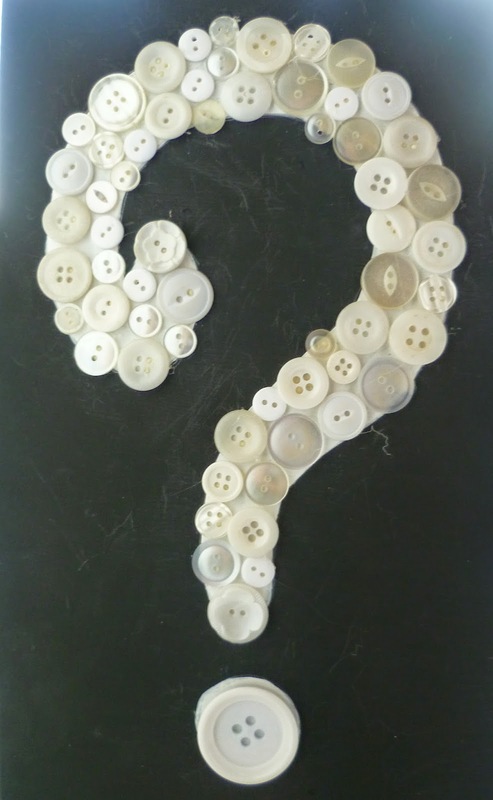 There were some vintage mother of pearl buttons which glistened in the sun light, something they had not seen for years. It must be the heat because both Jane (big sister) and myself have gone a little off doing any tatting at the moment. I am concentrating on altering some clothes, a job that I hate, but it does mean that I get back to wearing them, especially as they are for the Summer weather, which may not last for much longer. This is my latest tatting project which has taken a week so far! 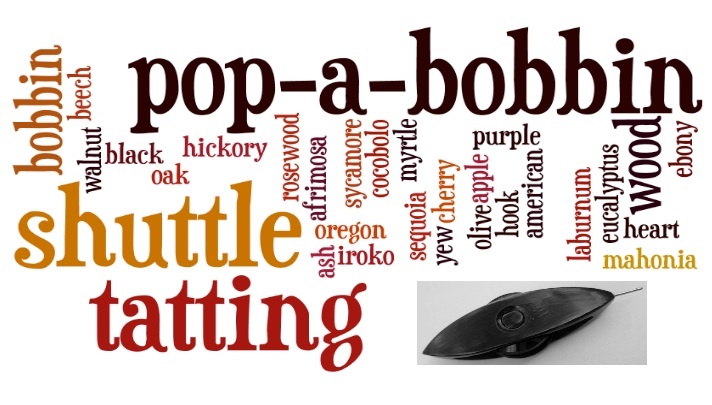 It could become an edging or even a necklace! Thought you would like to see some real creativity this is a piece of wood we found in this place. If you look closely at the left hand side you can see the shape of a deer's head its eye and nose in particular. It did not fair too well outside in the winter as some of it split but this is what it was finally turned into. 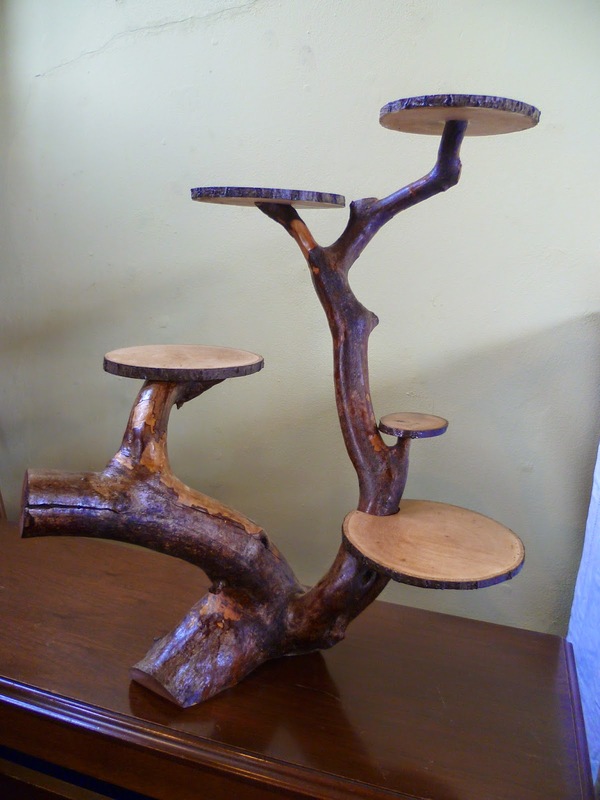 The flat pieces are made out of beech and came from a huge log that was cut with a chain saw. Over the last few weeks I have been involved in organising and setting up two exhibitions in two different churches, one traditional and one quite modern. I mentioned the Art and Craft Exhibition in my previous post and last weekend another church was transformed into a History and Heritage Exhibition. 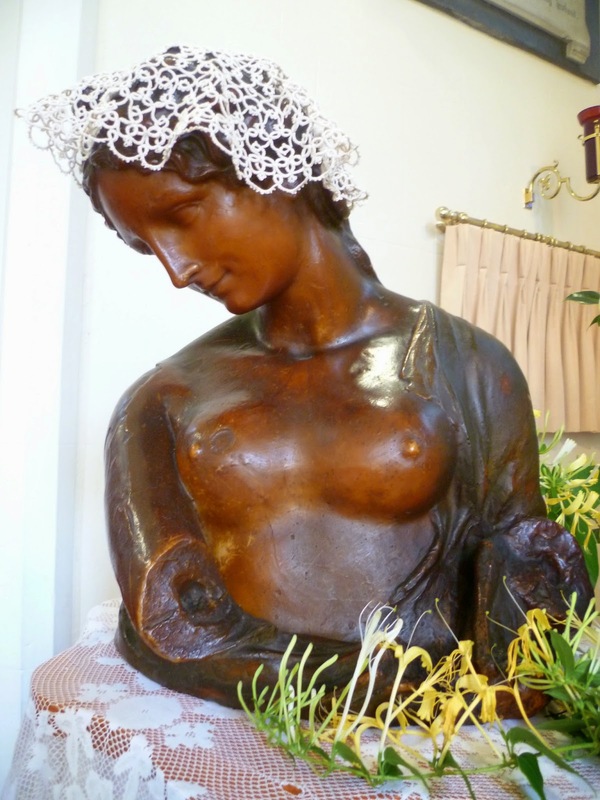 It included artifacts from a famous Victorian Artist who lived in the village and is buried in the churchyard. Items and history relating to a family who had and still have connections with the area. Also a brief history of the men who went to fight in the two World Wars. 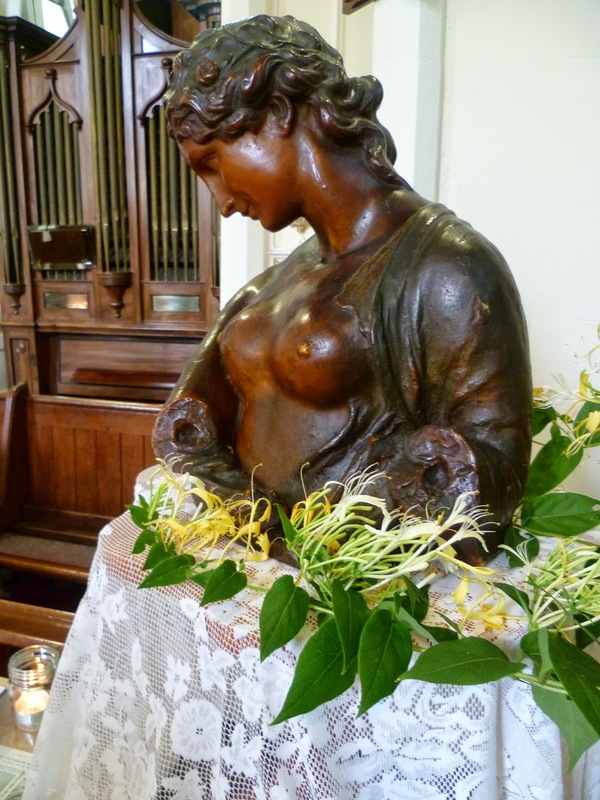 May I introduce the Goddess Flora, she is made from wax and as the temperatures in England are extremely high at the moment, she was transported to church in a box surrounded by frozen peas! Flora was so easy to photograph too as she never moved an inch, she was the star attraction of the exhibition and she knew it! Tatting and a lot more! At the weekend we held an Art and Craft Exhibition in one of the churches. It was an extremely successful event with a lot of items on show, many of which were for sale and a good many were actually sold. Here is a table with some tatting and other craft items on. You will see a bag on the table, I have now made two more of them, but this one was actually sold at the weekend. The one on the far right is in the process of being made. Notice the many buttons sewn on the bags! And talking of buttons this is what I also made for the exhibition. Someone who lives in the village was very interested in the items which included buttons as she makes wedding bouquets with them. She also wants to learn to tat, but first I have some buttons to give her that are no use to me, looks like we are heading for a 'button afternoon' before the year is out! I am hoping to get back to some serious tatting soon as there is a lot I want to make. As you will see from this post a memorial was erected to five USA pilots whose aircraft crashed into woodland 70 years ago today. This morning as the sun shone brightly over this beautiful wood, a short service was held to remember these men, with the pupils from the near by village school in attendance. We sang the National Anthem and then The Stars and Stripes (rather hesitantly as the words and music were unfamiliar to us) but we managed with out any music to accompany us. 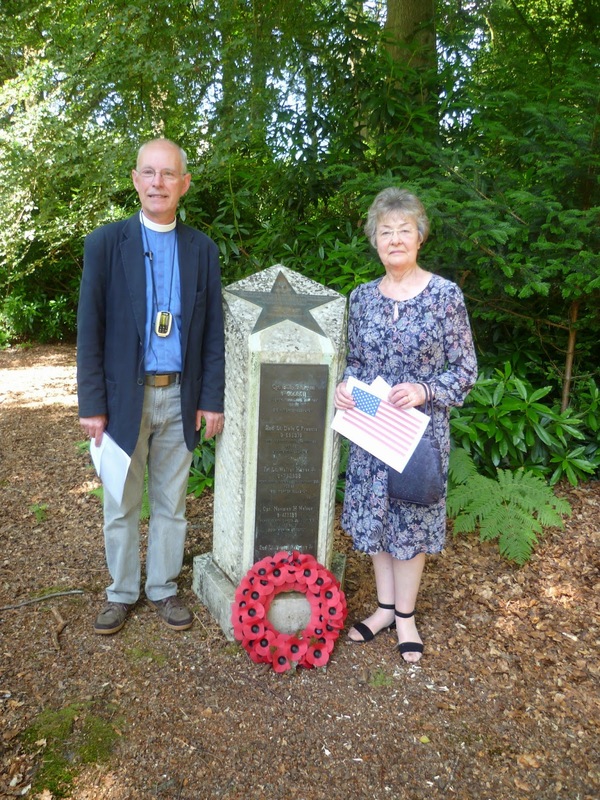 In the picture is the Vicar standing by the memorial and beside him is the mother of the boy who, when he was only 16 years of age, found a small piece of green painted aluminium sheet lying in the wood. Over the next few weeks his search continued and he found an identification bracelet bearing a set of wings on the front with the name and serial number on the reverse. Also recovered was a pilot's whistle and the remains of three wrist watches, this was 35 years after the accident. The memorial was dedicated on 2nd July 1998.